Our office is small and friendly. When you schedule as a new patient, we reserve extra time to listen to you and discuss any of your dental concerns. Dr. Hardel will complete a comprehensive examination of your whole mouth, as he screens for oral cancer, checks your jaw joints and muscles, and evaluates how your teeth fit together. We'll also take the necessary films, evaluate the gum tissue and bone supporting your teeth, determine the type of cleaning you'll need and check for cavities. We want to help you understand your whole mouth, not just your teeth! Office hours are Monday through Thursday, 7 a.m. to 4 p.m. After hours emergency care is available to current patients of record. Please call anytime to set up your new patient visit. Dr. Hardel works with many insurances, and will gladly process your insurance claim for you. We are located near the intersection of 35W and 694 in "old downtown" New Brighton, between the fire station and the New Brighton Family Service Center and Library. Tom Hardel grew up in Brownton, Minnesota and earned a degree in German and minors in Business and Communications at the University of Minnesota-Morris. He graduated from the University of Minnesota Dental School in 1992, then completed a one year residency in family dentistry. 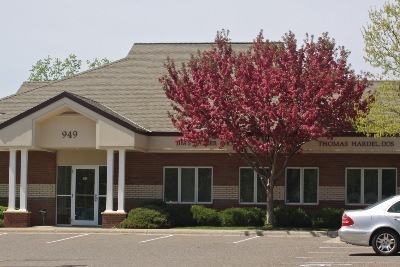 He practiced general dentistry in Moose Lake, Minnesota, before relocating to the Twin Cities. Dr. Hardel places a high priority on continuing education and is especially interested in restoring teeth to their proper form and function. Dr. Hardel is a member of the Minnesota Dental Association, the American Dental Association, the St. Paul District Dental Society Peer Review Committee, belongs to an active study club and is an alumni of the Pankey Institute. His interests include cross country skiing and racing, fly fishing, photography, canoeing, and camping with his wife and daughters.